Nothing brightens up a breakfast nook like a colorful café curtain. 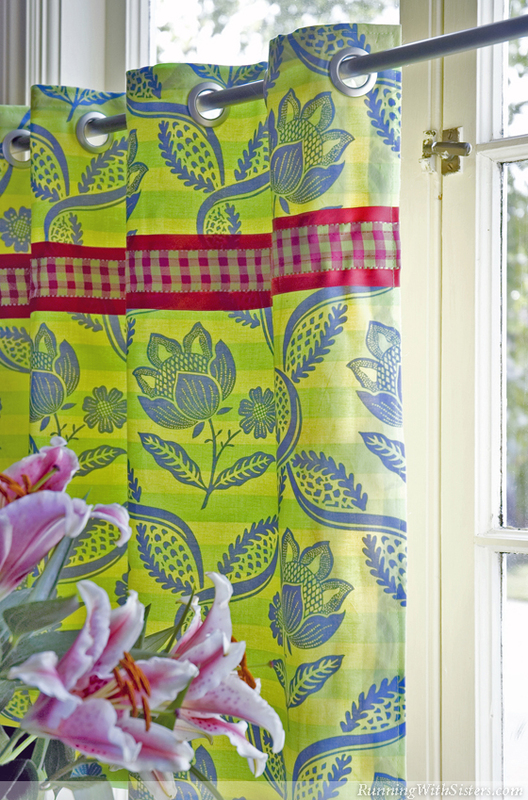 This cheerful window treatment is usually hung on the lower half of a window providing privacy while allowing sunshine in. 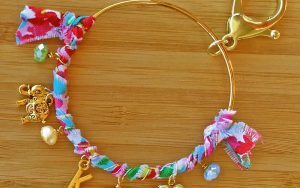 To make your own, just start with a Lilly Pulitzer inspired print in a preppy palette, then add a wide stripe of magenta ribbon topped with a playful plaid. Brushed silver grommets give this country curtain an urban twist. Project Pointer: When it comes to curtains, your window determines the size. So before you hit the fabric store, get out your tape measure. Start by measuring the area you want the curtain to cover. Add 10” to your width measurement to account for fullness and hems, then add 2” to the height measurement. 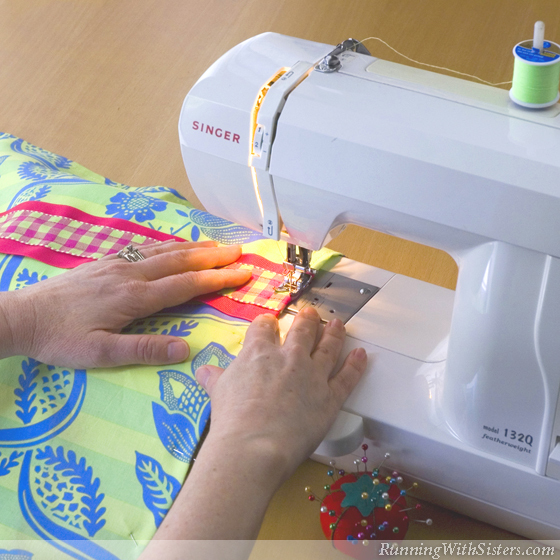 Use this measurement to cut your fabric and ribbons. 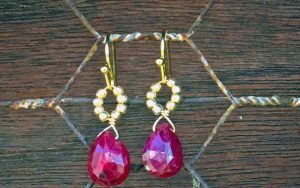 No pattern necessary! Step 1. To create the magenta stripe, lay one length of the magenta ribbon across the lime fabric 8” from the top (check the orientation of the print). Pin the top edge of the ribbon to the lime fabric. 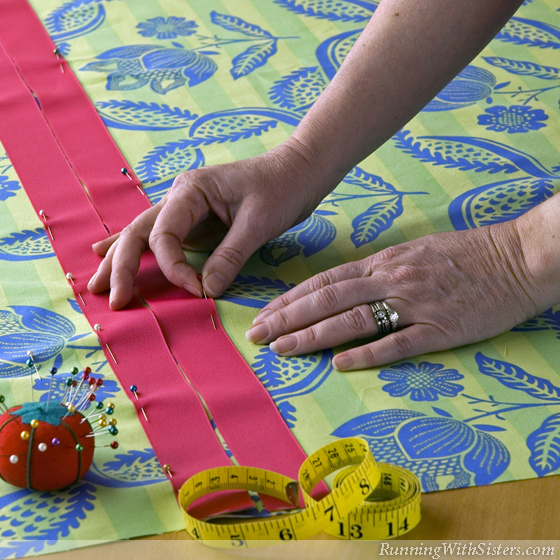 Lay the second length of magenta ribbon directly below the first and pin the bottom edge of the second ribbon to the lime fabric. Step 2. Lay the plaid ribbon down the center of the magenta ribbons, over the seam, and pin. Step 3. 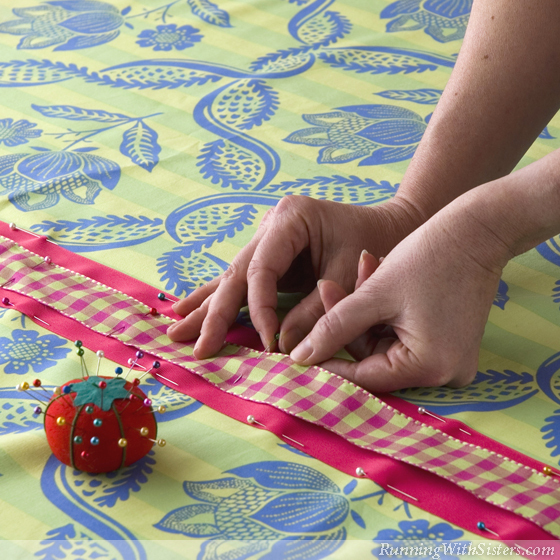 Using a sewing machine and the magenta thread, sew the plaid ribbon across the top edge and bottom edge. Step 4. To hem the edges of the lime fabric, lay the fabric facedown and fold each side 1” over. Pin the hem and press with an iron. (Be sure to fold the ends of the ribbon over with the hem of the fabric.) 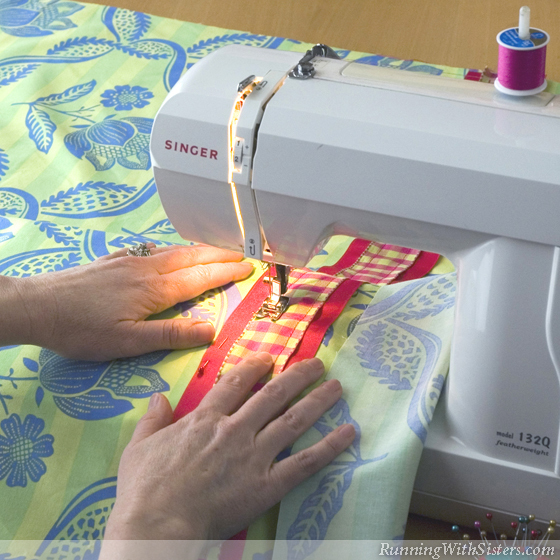 Using a sewing machine and the lime thread, sew all the way around the hem of the curtain, ½” from the edge. Step 5. 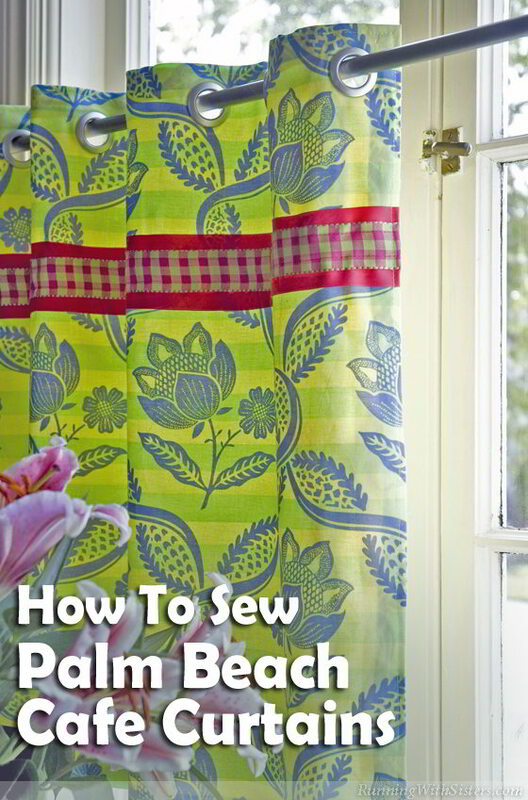 To create the curtain lining, lay the lime fabric down then lay the lemon fabric on top. The lining needs to be slightly smaller than the curtain, so fold each side of the lining over revealing ¼” of the lime curtain. 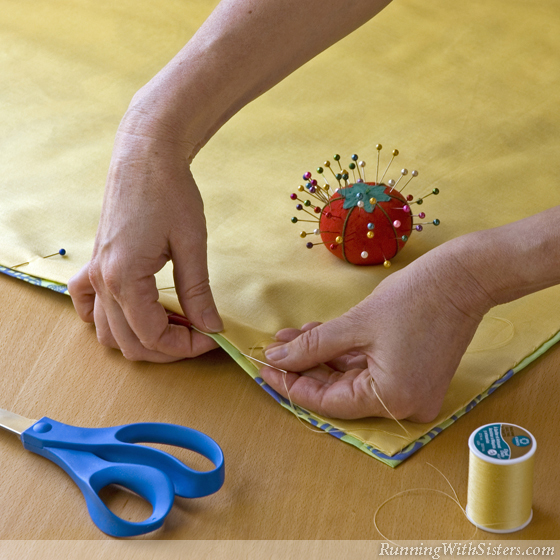 Pin the edges of the lining, then iron to create a hem. Step 6. Lay the lime fabric facedown and center the lining faceup on top. Pin into place. Using a sewing needle and the lemon thread, hand stitch the edge of the lemon lining to the hem of the lime fabric. Be careful not to stitch through to the front of the lime curtain. Step 7. 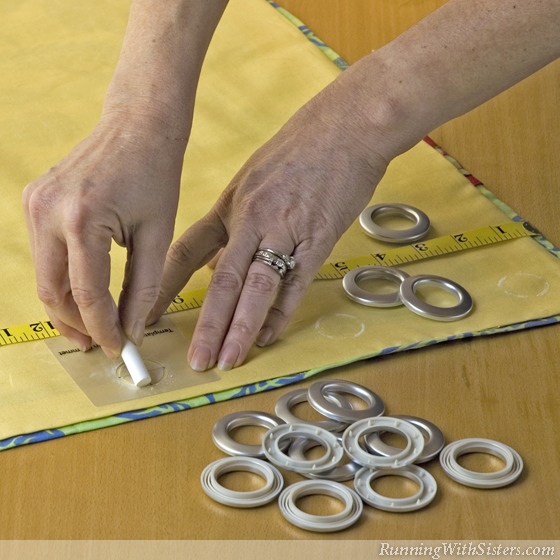 To set the grommets, lay the measuring tape 1½” from the top of the curtain. Use the template provided with the grommets and mark a grommet hole with chalk on the left-hand side of the curtain starting 1½” from the side and the top. Then mark a grommet hole on the right-hand side of the curtain 1½” from the side and the top. Evenly space the rest of the grommet holes between these two. Step 8. 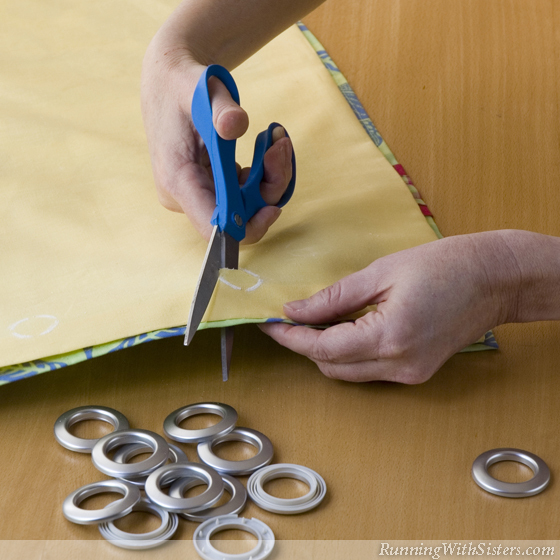 To cut a grommet hole, pinch the fabric and make a horizontal cut in the center of the template guidelines. Slip your scissors into the slit and cut around the edge of the circle guideline. Then snap the grommet into place. Repeat until all grommets are set. Now hang your cute café curtain, grab a latte, and admire your handiwork! 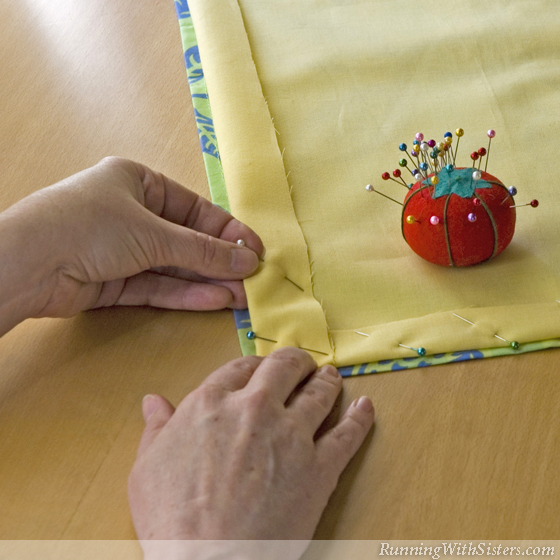 That Stitch Is Outta Sight: When attaching the lining, keep your stitches from showing through to the front of the curtain by using a slipstitch. Simply tack the hems of the two fabrics together by stitching inside each hem in a back and forth pattern. Nice tutorial. 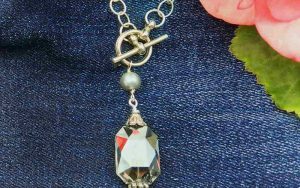 Thanks for showing the blind hem stitch; I always wondered how to do it. 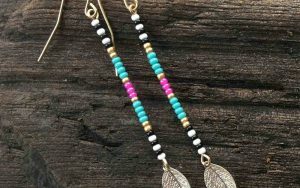 Great advice to use tailor’ chalk for the grommet placement. I’ve been postponing my 10′ wide drapes because I have JUST barely enough fabric and can’t afford to make a mistake. You’ve been a blessing to someone today. Thanks for the kind words. So glad we could help! Are the sides of the lining attached to the curtain or just the bottom hem? 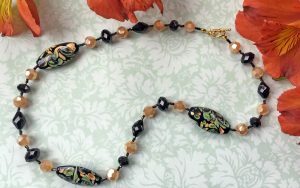 Can you identify the lime green print you used, please? Can a lightweight oil cloth be used for the main curtain? We don’t see why not? Let us know how it turns out, Suzy!